As passengers depart the A Train at Mott Avenue in Far Rockaway, they’re greeted by the dilapidated sight of the Thriftway Shopping Center. The once-vibrant marketplace is now a constant reminder of what happens when communities are forgotten, and their people are ignored. The shopping center is home to four shops— the Thriftway Pharmacy, a Capital One Bank, a Dunkin Donuts, and a Food Dynasty Supermarket. These community staples are surrounded by more than 20 empty storefronts, which adds to the community’s feelings of abandonment. The Far Rockaway Shopping Center used to be a jewel of the community and now after nearly 30 years of stagnation, a major transformation is on the horizon. There have been multiple attempts to revitalize the Far Rockaway Shopping Center, locally known as Thriftway, for decades. However, most plans were abandoned or shut down by Rita Stark, former owner of the property. Stark, who inherited the properties throughout southeast Queens from her father, was notorious for ignoring requests from businesses to transform the spaces or offers to sell. Stark seemingly began to warm up to the idea of developing her property in her later years, as evidenced by new additions. In 2015, Dunkin Donuts opened in the shopping center, which marks the first new development on the property since the 1980’s. Since Stark’s death in October 2016, the plans for redevelopment have pushed forward. Thanks to funding from Mayor de Blasio and the determination of City Councilman Donovan Richards, the shopping center will get a major makeover and, hopefully, will breathe new life into Far Rockaway’s struggling downtown. Renamed the Far Rockaway Village, the project will transform the shopping center into a hub for the community. The Far Rockaway Village project is part of an overall $288 million of new city investment in the area. Currently, the shopping center is a single-level commercial space. In early March 2018, Mott Center LLC developers filed permits with the Department of Buildings for the first phase of construction for the project, which is said to fulfill approximately one third of the project’s promises. This first phase of new development will be built on currently unutilized portions of the space. Construction of the first phase is scheduled to begin in August 2018 and projected to be completed by the end of 2021, though no demolition permits had yet been filed (as of time of print). Conservative estimates have other portions of the downtown revitalization project starting construction sometime in 2019. The site will be designed by Marvel Architects and built by Phipps Housing, a nonprofit that develops affordable housing across NYC, through a lease with Mott Center LLC, a part of Stark’s estate that is managed by her brother and nephews. Once the project is complete, Phipps Housing will continue management of the housing and public recreation areas of the site, while Mott Center LLC will oversee the retail portion. 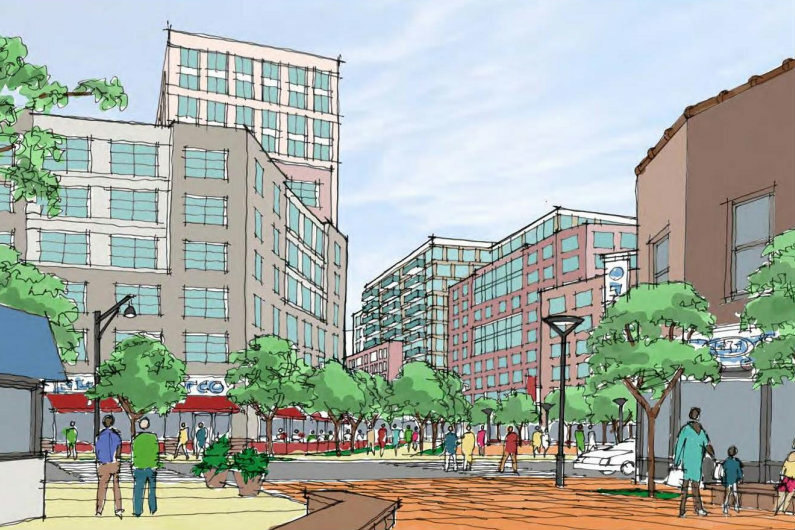 The new 12-story development will be 125 feet tall and include 90,000 square feet of retail and commercial space, a public plaza, and nearly 700 units of mixed-income housing. 1,000 more units of housing will be built in future phases of the project. All new housing will be 100 percent affordable, though the exact affordability breakdowns have yet to be finalized. The completed project will include 295 new parking spaces, a grocery store, expanded sidewalks, ungraded sewer infrastructure, and a new open, public space on a city-owned lot that currently sits vacant. The Far Rockaway Library will also be getting an upgrade as part of the Downtown Far Rockaway revitalization. Despite promises that the library project would begin in spring 2018, construction is not expected to start until fall 2019. The new 2-story library building was designed by famous architect Snøhetta and has received the Annual Award for Excellence in Design, the Public Design Commission of the City of New York's recognition for outstanding public projects. However, some locals are skeptical that the sleek modern aesthetic of the new library building will fit in alongside older buildings on Mott Avenue. Though there is definitely a need for more affordable housing and overall economic development in Far Rockaway, fears of gentrification and being priced out of the area persist in the minds of many of its current residents, nearly a quarter of whom live below the poverty line, according to a recent report by the New York State Comptroller’s office. Since 2000, average household income in Far Rockaway has decreased by 6 percent while rents have risen by more than 26 percent. The Rockaway Advocate will continue to monitor the Downtown Far Rockaway revitalization process as it progresses over the coming months.